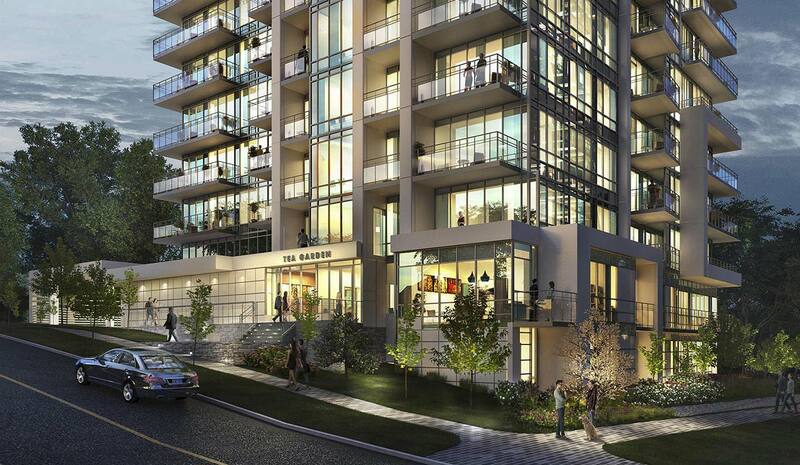 Tea Garden Condos, is a boutique condominium address across from Bayview subway and Bayview Village shopping centre. It’s time to get inspired. Comprising only 111 suites – from 1 bedrooms to 2-storey town lofts – Tea Garden offers exceptional, modern living in a building that draws inspiration from the world of boutique hotels. Welcome to sophisticated boutique living in the desirable Bayview Village neighbourhood. Enjoy life ensconced in style and luxury. This is Tea Garden. This is home.The main entrance is located on Teagarden Court. This is also where the lobby, lounge and amenity area is situated. Apartments on the ground floor will have patios & landscaped yard facing north. There is outdoor amenity space on the roof top terrace. There is one loading dock and access to the 105 vehicle parking spaces is located on the western site of the building by Teagarden Court. The entrance will have a covered canopy for those bad weather days. Conveniently located steps from Bayview subway and Bayview Village shopping and dinging. Tea Garden is an intimate boutique condo address graced with contemporary architecture and luxurious amenities. From the exterior, Tea Garden is marked by its strong, modern lines, which frame and reinforce the building’s spacious balconies and expansive windows. As you enter the lobby, soft tones and natural elements of wood and stone welcome you into the space, providing a soothing respite from the outside world. Draw further into the heart of the lobby, and a gentle burbling ripple calls your attention to the striking water feature that anchors this serene space. Throughout the building, subtle details, natural light and a restrained design approach result in a sophisticated yet thoroughly relaxing environment – inviting, embracing, letting you know you’re home. Tea Garden: EASY REACH OF IT ALL!